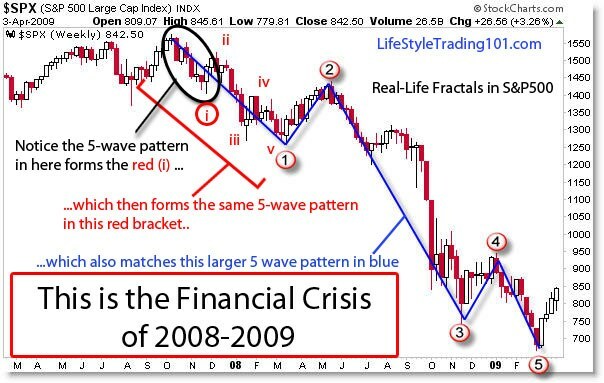 From an Elliott Wave perspective, the 2007-2009 was really just a massive c-wave down within a 4th wave A-B-C pattern. Look carefully from August 2007 that started the wave A and then october 2007 that made the B-wave top. From there, we had a large 1-2-3-4-5 pattern to the downside as labeled below. This is matches a text-book pattern shown at the right – a C-wave Down that appears over and over throughout multiple time frames in stock market history. If you look deeper – within each leg of the pattern – there’s smaller-sized 1-2-3-4-5 patterns in there. This chart shows a Monthly S&P500 Chart – but as you can see it also appears on smaller time frames. Detecting these patterns can greatly enhance your ability to make money in the stock market. Learn more by signing up for our newsletter and service.